I love clocks that tick. It's soothing, especially when I'm going to sleep. I'm less fond of chiming clocks but you could do this with a battery operated chiming movement as well. The first part is super easy and makes a great way to showcase Spoonflower swatches as well (oh! 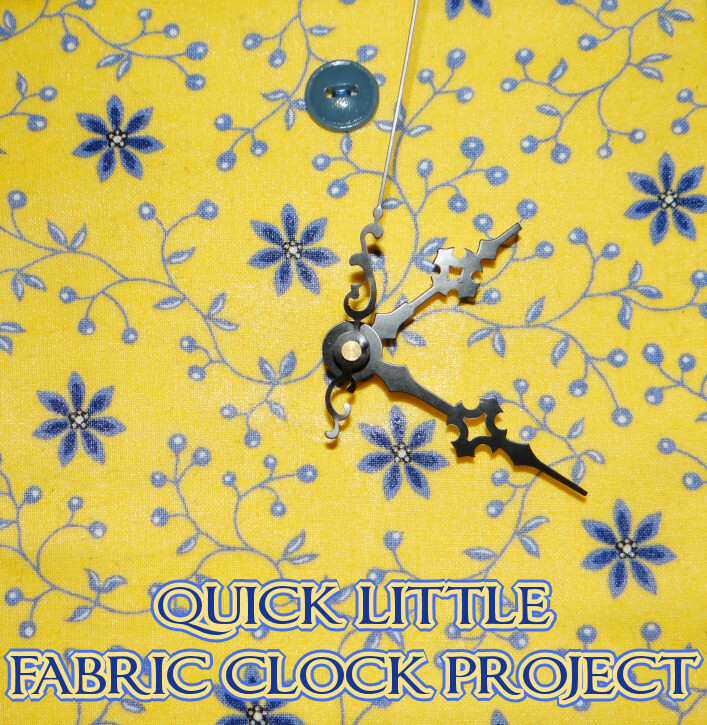 Or use a Spoonflower swatch to make a clock! )- You're going to wrap the canvas with the fabric stapling it in place on the back of the stretcher bars. 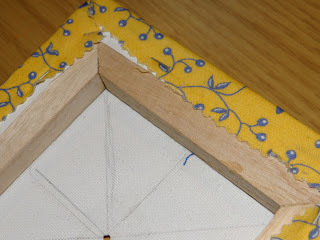 Fold the corners in for nice neat corners. Which turned out less than perfect on my clock, so if you have fabric that wants to get bulky or balky, trim the corners a bit before folding the corners in. You need to mark the center for the shaft of your clock movement. 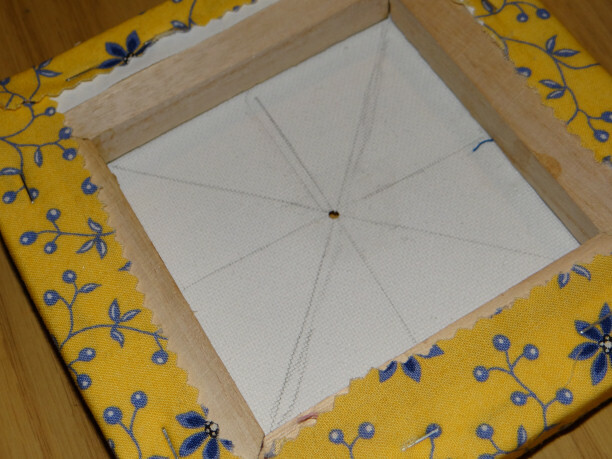 To do that, use a pencil on the back of the canvas. Using a straight edge, draw a line from one corner diagonal to the other corner, repeat with the other two corners. Then you'll line the ruler up square with the middle which is where the diagonal lines meet, and draw lines vertically and horizontally. Do you see the bit of thread peeking on the right hand side? That's the 12 o'clock mark. 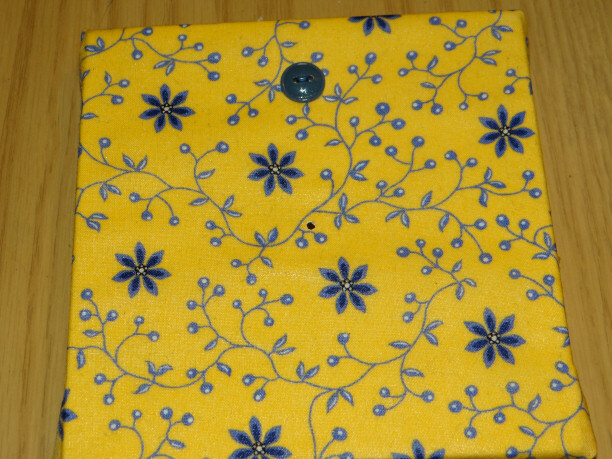 Center your button over the vertical line on the front of the canvas, on the inside edge of the stretcher bar, and stitch into place. I found the easiest way to make that knot tight was leave a long tail, and then tie the tails in a square knot using 2 strands of embroidery floss to stitch the button in place. Using the foam brush and a firm touch to really work the Mod Podge into the fabric, paint Mod Podge over the front and sides of the canvas. Let that dry for an hour, then put Mod Podge on the back of the canvas. Let both sides dry completely. This step makes it easier to clean and it seals the fabric so the hole you cut for the movement won't cause fraying. 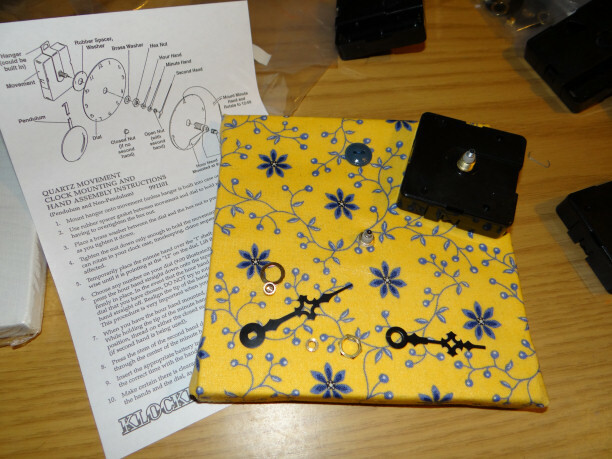 Cut a hole using the guidelines on the back that's big enough for your clock movement shaft. The movement will come with instructions, so follow the instructions to install the movement. 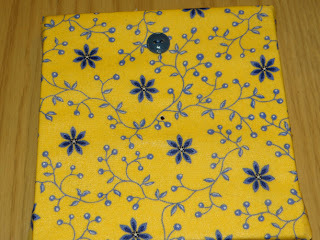 If you click on this image, you'll see the shaft of the movement I used poking up from the center of the fabric. Put a battery in the movement, hang and enjoy! 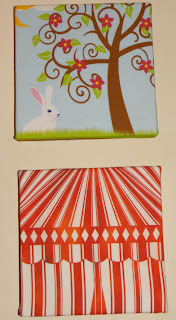 You can also staple Spoonflower 8x8 swatches to 6x6 canvases for quick art work. 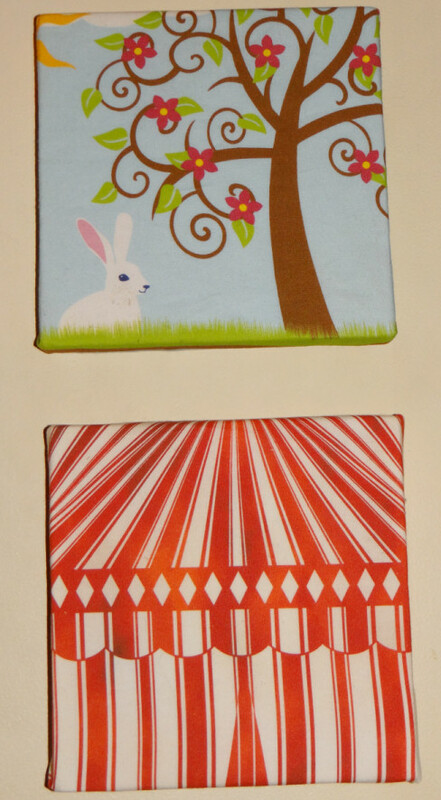 The two shown are from my fabric collections at Spoonflower. The clock movement I got from Klockit is the #10043, there are price breaks for quantity. The size fits in the space between the stretcher bars of the canvas very well and the profile is the same depth as the canvas. Klockit does use SmartPost for standard shipping so if you're in someplace like Alaska, you could wind up waiting very impatiently and wishing very much you expedited shipping. They do have a great selection of movements, hands and second hands!